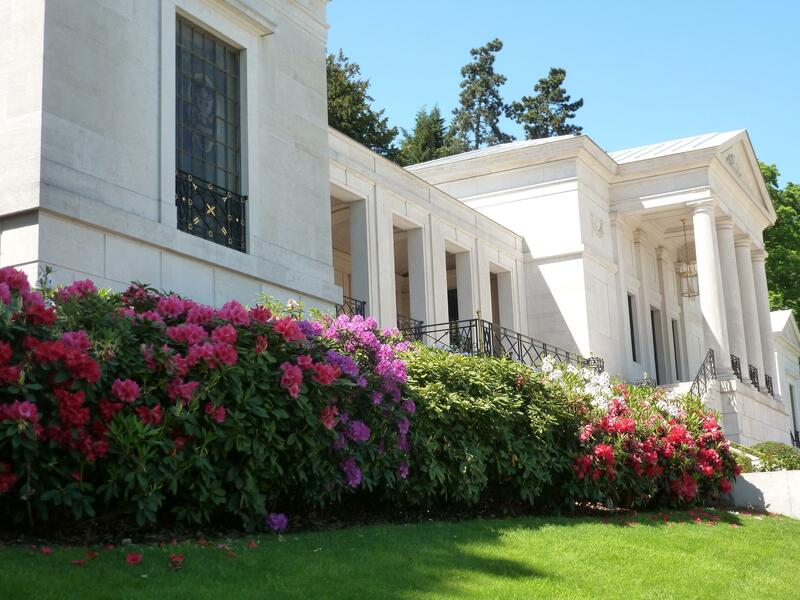 The American Cemetery in Suresnes, France overlooking the city of Paris is the final resting place of 1,541 World War I and II heroes. 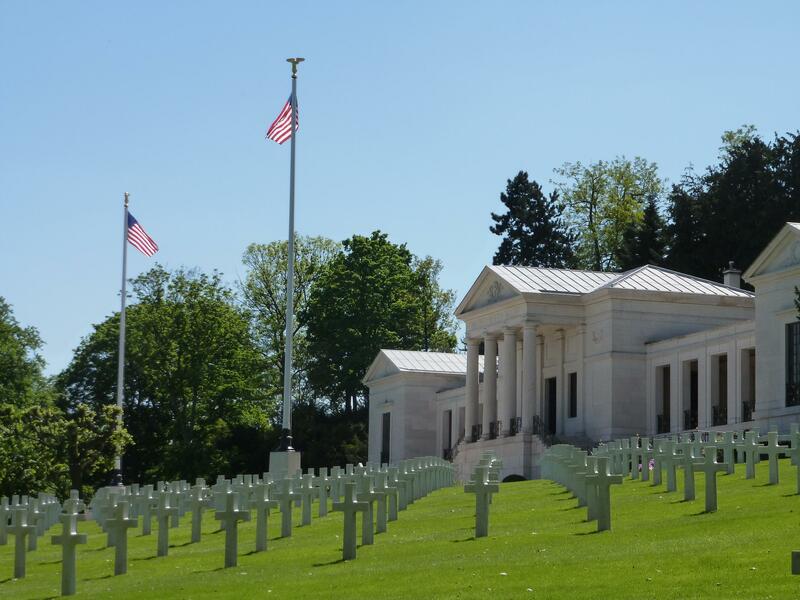 Norm and I made it our mission to visit as many American cemeteries as we can while in Europe. 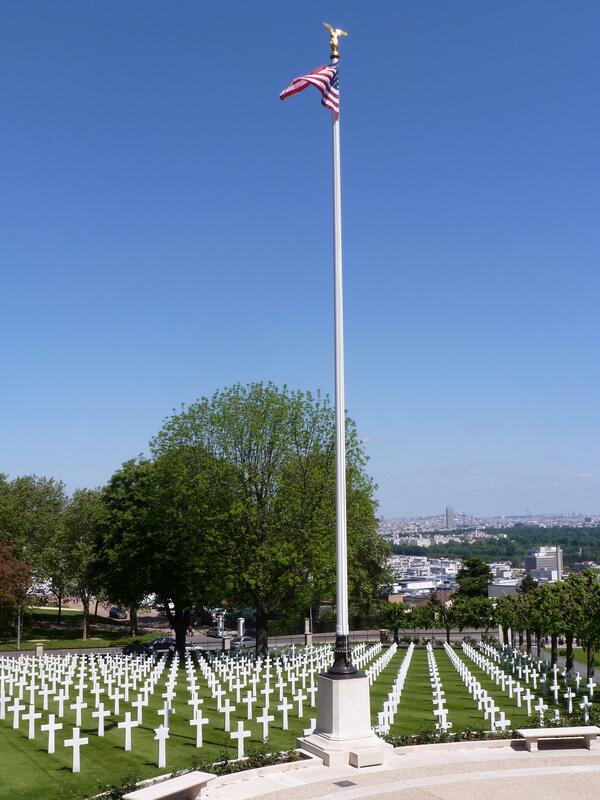 Suresnes is a relatively small overseas American cemetery. One thousand five hundred forty-one casualties does not seem like a small number, even by comparison, when one is staring down row upon row of marble crosses and stars of David. 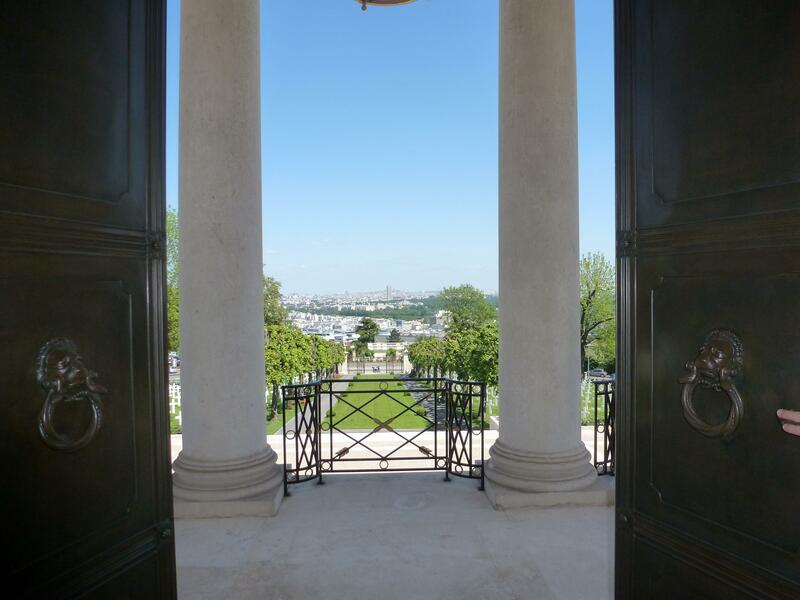 As we strolled down the edge of the rows, I read aloud the names that I saw etched in the marble. If I say these names, then they are real people, not just words on a stone. Unfortunately, very little is known about the persons behind the names, even though the ABMC does their best to research each man and woman’s story and to record them for posterity. 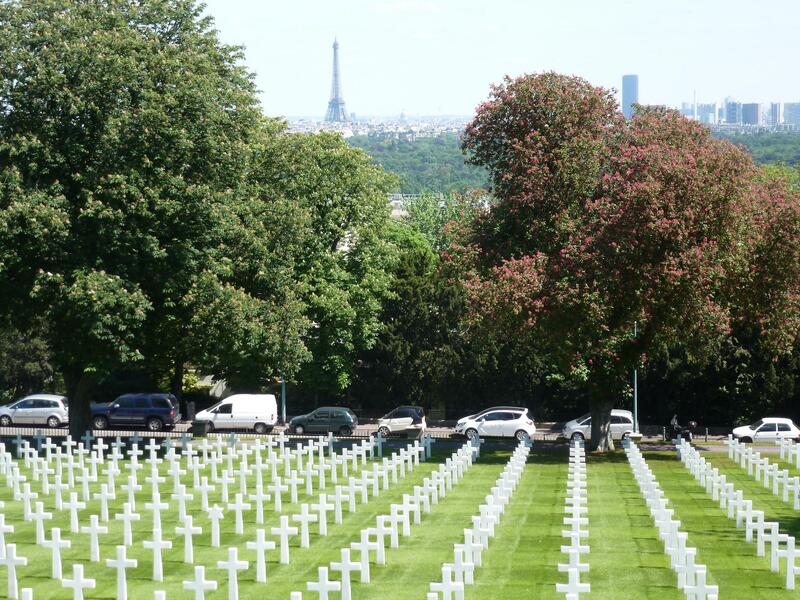 At first I felt sad that these brave men and women had to rest forever amidst the hustle and bustle of a city, even if that metropolis is the City of Light. Then I noticed the Eiffel Tower standing tall and proud in the distance and thought, This is a nice view for eternity. Perhaps they are not so ill at ease in this city surrounded by a different kind of beauty. We continued around the path past the Visitor Center and up the hill to the Chapel. 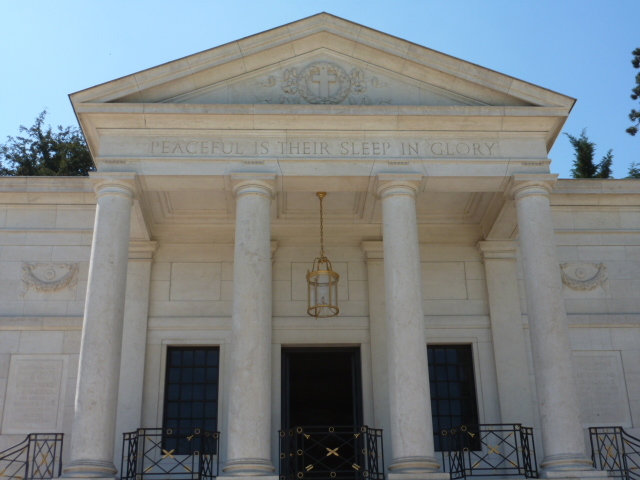 I admired the inscription on the portico: Peaceful is their sleep in glory. Freedom from oppression. 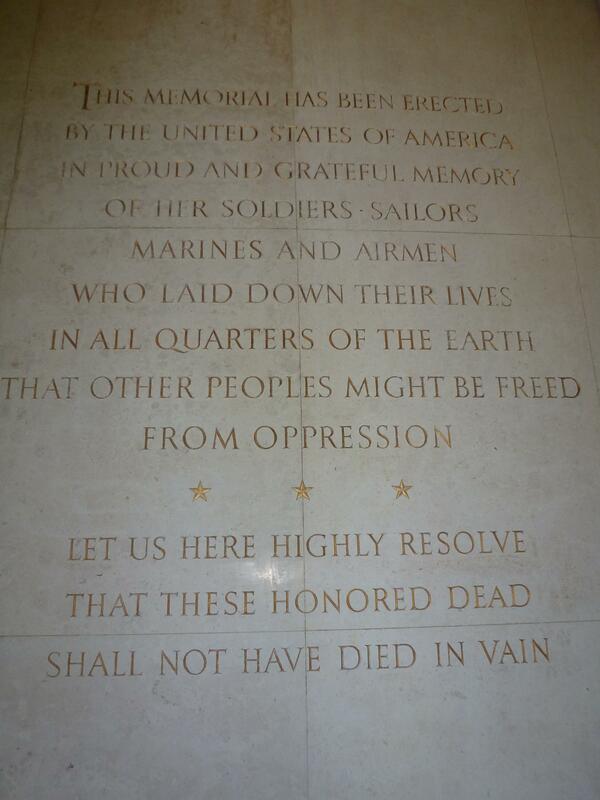 Yes, this is what America stands for. 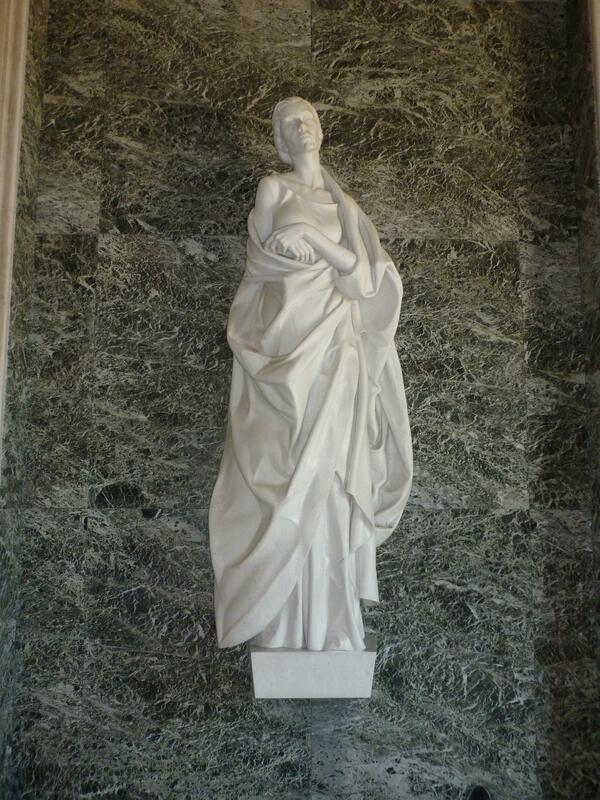 This graceful beauty stands suspended in the chapel dedicated to the World War I heroes. I think the soldiers feel a little lighter being near her. 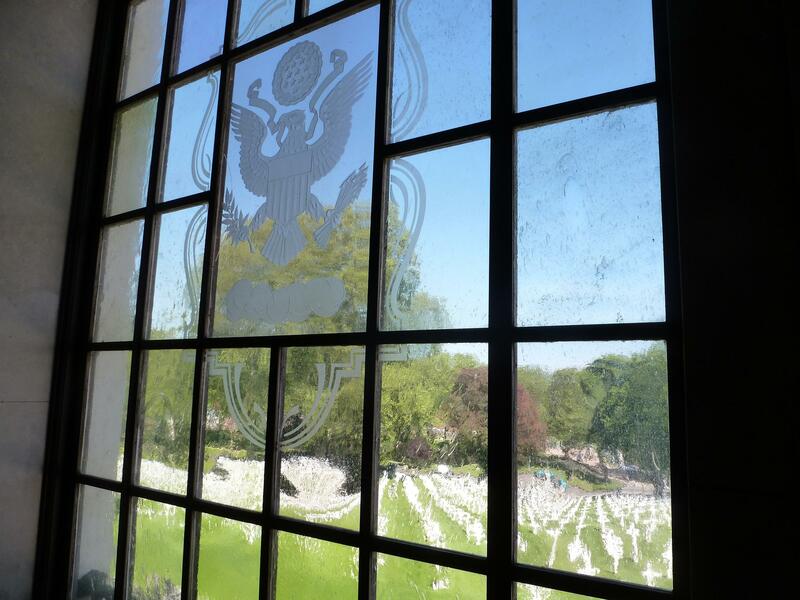 An eagle etched in the glass of the chapel window overlooks the cemetery. From here, the statue can gaze upon her dead, holding vigil over them forever. The cool dampness of the chapel opened to the wide expanse of sunshine, warming our kin. Sunshine – a rare and welcome commodity in Paris – is the least that they deserve. Norm and I stopped on the parvis for a moment to reflect. Seeing all of these men and women lying there, after having sacrificed their very lives for others – it takes more than a moment to digest. Though I wish I didn’t have to leave them there, soon it was time to go, so I said my silent goodbyes and left richer than when I arrived. 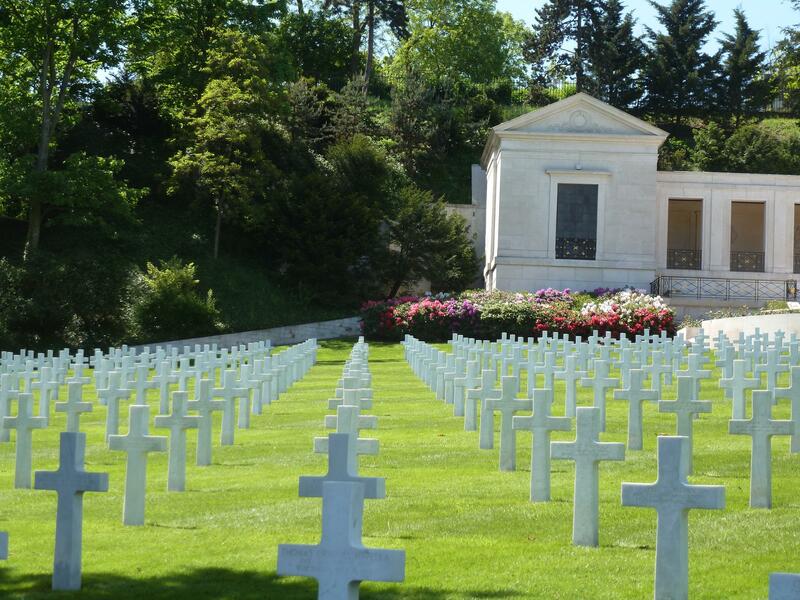 We visited Suresne in June – I have a great uncle who was from Chicago buried there who died in the pandemic during WWI. It is a beautiful cemetery and it’s nice to know he has peaceful resting place. I wonder if the chapel is based on Arlington.